The Early Roman Society, I.The Early Roman Government, II.The Early Roman Religion, III. The Social Institutions.We have thus far traced the origin of the Roman city, according to what seem to be the most reasonable and generally accepted views. Various writers on early Roman history, of course, differ upon many matters of detail; but they are fairly well agreed that the Roman city grew out of a settlement of Latin shepherds and farmers on the Palatine hill; and that this first settlement slowly expanded by taking in and uniting with itself the settlements established on the other hills. But to understand more fully the beginnings of this little city-state, we must look at the way in which the people were organized, that is, how they were arranged in social groups; how they were ruled; and how their society and government were held together and made strong by a common religion. Let us look first at the early social institutions. The Roman Family.The smallest group of Roman society was the family, which the early Romans regarded as the most important and sacred of all human institutions. At its head was the household father (paterfamilias). He was supreme ruler over all the members of the household; his power extended to life and death. He had charge of the family worship and performed the religious rites about the sacred fire, which was kept burning upon the family altar. Around the family hearth were gathered the sons and daughters, grandsons and granddaughters, and also, the adopted children,all of whom remained under the power of the father as long as he lived. The family might also have dependent members, called “clients,” who looked up to the father as their “patron”; and also slaves, who served the father as their master. Every Roman looked with pride upon his family and the deeds of his ancestors; and it was regarded as a great calamity for the family worship to become extinct. The Roman Gens.A number of families which were supposed to be descended from a common ancestor formed a clan, or gens. Like the family, the gens was bound together by common religious rites. It was also governed by a common chief or ruler (decurio), who performed the religious rites, and led the people in war. The Roman Curia.A number of gentes formed a still larger group, called a curia. In ancient times, when different people wished to unite, it was customary for them to make the union sacred by worshiping some common god. So the curia was bound together by the worship of a common deity. 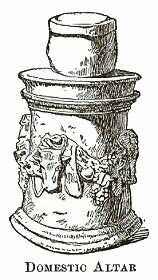 To preside over the common worship, a chief (curio) was selected, who was also the military commander in time of war, and chief magistrate in time of peace. The chief was assisted by a council of elders; and upon the most important questions he consulted the members of the curia in a common place of meeting (comitium). So that the curia was a small confederation of gentes, and made what we might call a little state. The Roman Tribes.There was in the early Roman society a still larger group than the curia; it was what was called the tribe. It was a collection of curiae which had united for purposes of common defense and had come to form quite a distinct and well-organized community, like that which had settled upon the Palatine hill, and also like the Sabine community which had settled upon the Quirinal. Each of these settlements was therefore a tribe. Each had its chief, or king (rex), who was priest of the common religion, military commander in time of war, and civil magistrate to settle all disputes. Like the curia, it had also a council of elders and a general assembly of all people capable of bearing arms. Three of such tribes formed the whole Roman people. The Growth of the Roman Government.It will now be easy for us to understand how the government of the whole united city came into existence. Each of the tribes, as we have seen, had its own king, its council of elders, and its general assembly. When the tribes on the Palatine and Quirinal hills united and became one people, their governments were also united and became one government. For example, their two kings were replaced by one king chosen alternately from each tribe. Their two councils of one hundred members each were united in a single council of two hundred members. Their two assemblies, each one of which was made up of ten curiae, were combined into a single assembly of twenty curiae. And when the third tribe is added, we have a single king, a council of elders made up of three hundred members, and an assembly of the people composed of thirty curiae. The Roman King.The Roman king was the chief of the whole people. He was elected by all the people in their common assembly and inaugurated under the approval of the gods. He was in a sense the father of the whole nation. He was the chief priest of the national religion. He was the military commander of the people, whom he called to arms in time of war. He administered law and justice, and like the father of the household had the power of life and death over all his subjects. The Roman Senate.The council of elders for the united city was called the senate (from senex, an old man). It was composed of the chief men of the gentes, chosen by the king to assist him with their advice. It comprised at first one hundred members, then two hundred, and finally three hundredthe original number having been doubled and tripled, with the addition of the second and third tribes. The senate at first had no power to make laws, only the power to give advice, which the king might accept or not, as he pleased. The Comitia Curiata.All the people of the thirty curiae, capable of bearing arms, formed a general assembly of the united city, called the comitia curiata. In this assembly each curia had a single vote, and the will of the assembly was determined by a majority of such votes. In a certain sense the comitia curiata was the ultimate authority in the state. It elected the king and passed a law conferring upon him his power. It ratified or rejected the most important proposals of the king regarding peace and war. The early city-state of Rome may then be described as a democratic monarchy, in which the power of the king was based upon the will of the people. The Growth of the Early Religion.Like the Roman government, so the early Roman religion grew up with the union of the various settlements into one community. 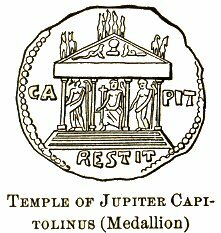 When the different tribes came together into the Roman city, they selected Jupiter and Mars as their common gods to be worshiped upon the Capitoline hill, together with Quirinus on the Quirinal. As the fire was kept burning on the family hearth, so the sacred fire of the city was kept burning in the temple of Vesta. The Roman people were filled with religious ideas. All power, from that of the household father to that of the king, was believed to come from above. In peace and in war they lived in the presence of the gods, and sought to remember them by worship and festivals. The Early Roman Deities.To the ancestral gods which were worshiped in the family and gens, were added the gods of nature, which the Romans saw everywhere. These earliest deities were those which naturally sprang from the imagination of a pastoral and agricultural people. In their gods they saw the protectors of their flocks and herds, and the guardians of the weather, the seasons, and the fruits of the soil. Jove (Jupiter) was the god of the sky and the elements of the air, the thunder and the lightning. Tellus was the goddess of the earth, and the mother of all living things; Saturn, the god of sowing; and Ceres, the goddess of the harvest; Minerva, the goddess of olives; Flora, of flowers; and Liber, the god of wine. The Religious Officers.The king was the supreme religious officer of the state; but he was assisted by other persons, whom he appointed for special religious duties. To each of the three great national godsJupiter, Mars, and Quirinuswas assigned a special priest, called a flamen. To keep the fires of Vesta always burning, there were appointed six vestal virgins, who were regarded as the consecrated daughters of the state. Special pontiffs, under the charge of a pontifex maximus, had charge of the religious festivals and ceremonies; and the fetiales were intrusted with the formality of declaring war. The Religious Observances.The Romans showed their remembrance of the gods in their prayers, offerings, and festivals. The prayers were addressed to the gods for the purpose of obtaining favors, and were often accompanied by vows. The religious offerings consisted either of the fruits of the earth, such as flowers, wine, milk, and honey; or the sacrifices of domestic animals, such as oxen, sheep, and swine. The festivals which were celebrated in honor of the gods were very numerous and were scattered through the different months of the year. The old Roman calendar contained a long list of these festival days. The new year began with March and was consecrated to Mars and celebrated with war festivals. Other religious festivals were devoted to the sowing of the seed, the gathering of the harvest, and similar events which belonged to the life of an agricultural people such as the early Romans were. How and Leigh, Ch. 4, “The Regal Period” (1). Pelham, Bk. I., Ch. 2, “The City and the Commonwealth” (1). Mommsen, Vol. I., Bk. I., Ch. 5, “Original Constitution of Rome” (2). Mommsen, abridged, Ch. 3, “Rome’s Original Constitution” (2). THE ROMAN RELIGION.Leighton, Ch. 4 (1); Ihne, Early Rome, Ch. 6 (5); Mommsen, Vol. I., Bk. I., Ch. 12 (2); Ramsay and Lanciani, Ch. 10 (8); Eschenburg, pp. 229-248 (8); Harper’s Dict. Antiqq., “Religio,” “Sacerdos,” “Sacrificium” (8); Coulanges, Bk. I. (20).